You control the pace so that students have time to think, ask and answer questions. The spreadsheet requirement is covered by an introduction in Part 2 to Microsoft Excel, gradually increasing techniques to include use of Pivot tables for extracting data from a large dataset. 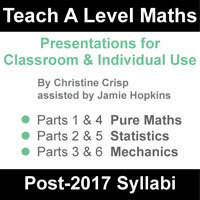 All 6 parts are now available across two downloads, for either Year 1/AS or Year 2/A2.